As designs, especially System on Chip designs, have become more complex, the need for generated good automated stimulus across the verification spectrum has increased. Today, the need for verification reuse and automated stimulus is clearly seen from block to subsystem to SoC-level verification. 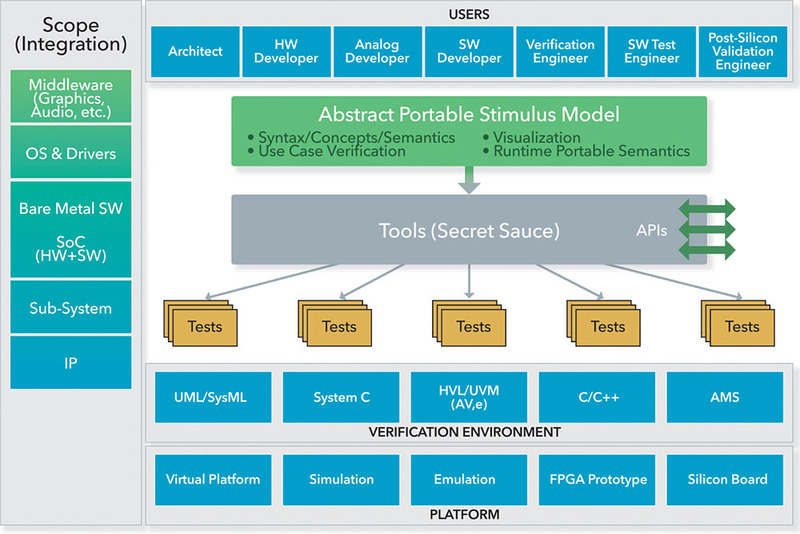 The Accellera Portable Test and Stimulus Standard (PSS) language supports this need with a language for capturing test scenarios in such a way that they are reusable across verification levels (block, subsystem, and SoC) and across execution environment (simulation, emulation, and prototype), as illustrated in figure 1. A language with such an ambitious scope must, of course, support a wide variety of applications and use models. This is important and necessary, but can also make it complicated to classify how PSS is being applied in a specific case. Recently, I’ve found it useful to categorize Portable Stimulus applications according to what type of reuse is most central to the application. I call these types of reuse the Axes of Reuse. Reuse along each of these axes has different characteristics in terms of the up-front work that must be done to enable that axis of reuse, and the benefits that are achieved by doing so. Across the remainder of this article, I’ll provide more detail on each axis of reuse with the goal that you can more-precisely identify which primary axis of reuse is right for you and your organization to select as you pilot PSS for the first time, and expand your use of PSS. Vertical reuse is what often comes to mind when people think of Portable Stimulus: block to system reuse of test intent. The diagram shown in figure 2 below is probably what you’d expect: test intent developed during verification of an IP block is reused when verifying a subsystem in which that IP is used, and then either reused on its own, or in conjunction with subsystem-level test intent, at the SoC level. Portable Stimulus is a declarative specification, which means that it is primarily constraint-based. Constraint-based descriptions capture the rules under which a description operates rather than a specific imple-mentation of those rules. Portable Stimulus makes it easy to customize the rules under which a description operates without modifying the original source code, making it easy to customize the behavior of test intent based on the specific constraints of the environment in which it is currently operating. Take, for example, a DMA IP. At block level, we use a UVM testbench environment like that shown in figure 3 to verify its operation. UVM helps us do transaction-oriented verification. So, for example, we might create a UVM sequence item to describe a DMA transfer on a single DMA channel, and a UVM sequence to exercise the DMA engine with a series of these DMA-transfer transactions. PSS helps us move our verification test intent up to the scenario level. With PSS, we characterize the key operations that a block can perform, and the rules about how those operations must be carried out. 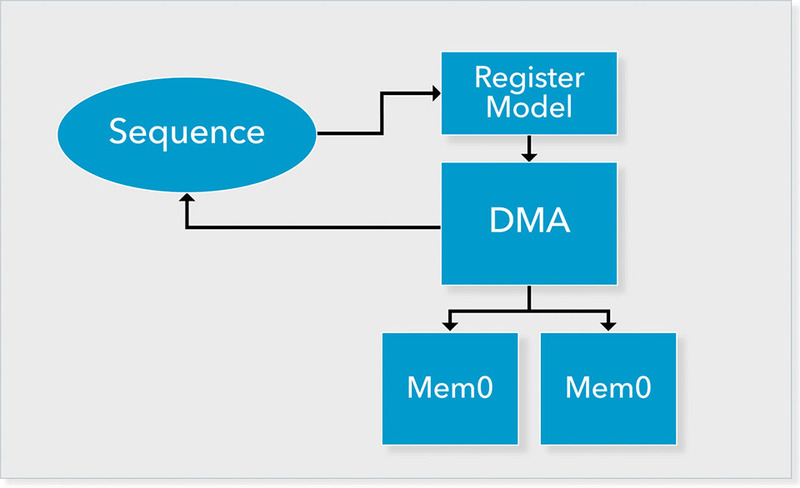 For our DMA engine, we might describe three key operations that the DMA can carry out: transfer from memory to memory, transfer from memory to a peripheral device, and transfer from a peripheral device to memory, sa shown in figure 4. In PSS, we create a new PSS action to describe each operation. For each of these actions, we characterize the data that the operation requires (if any) and the data (if any) that it produces. Our memory-to-memory transfer action needs to know where the source data is. This is modeled as an input (dat_i) to the action. The memory-to-memory transfer action transfers data to a destination location. We model this as an output (dat_o) so that other actions can input this information. PSS provides us many features in addition to action inputs and actions that help us model the way our actions can execute and how they can legally be combined into a scenario. The scenario-level modeling that PSS provides is useful at the block level. For example, each of our DMA actions requires access to a dedicated DMA channel because only one transfer at a time can run on each channel. Creating a scenario that runs four parallel transfers on four randomly-selected by unique DMA channels is as simple as the code shown above. We create an array of memory-to-memory transfer actions, add a constraint to ensure that the channel used by each is unique, then execute all four actions inside a ‘parallel’ block to cause all transfers to execute simultaneously. This ability to model test intent at a higher level of abstraction makes users more productive and allows the creation of more-complex tests even at the block level. However, the reuse benefits of modeling test intent using actions and scenario rules becomes even more apparent at the subsystem level. 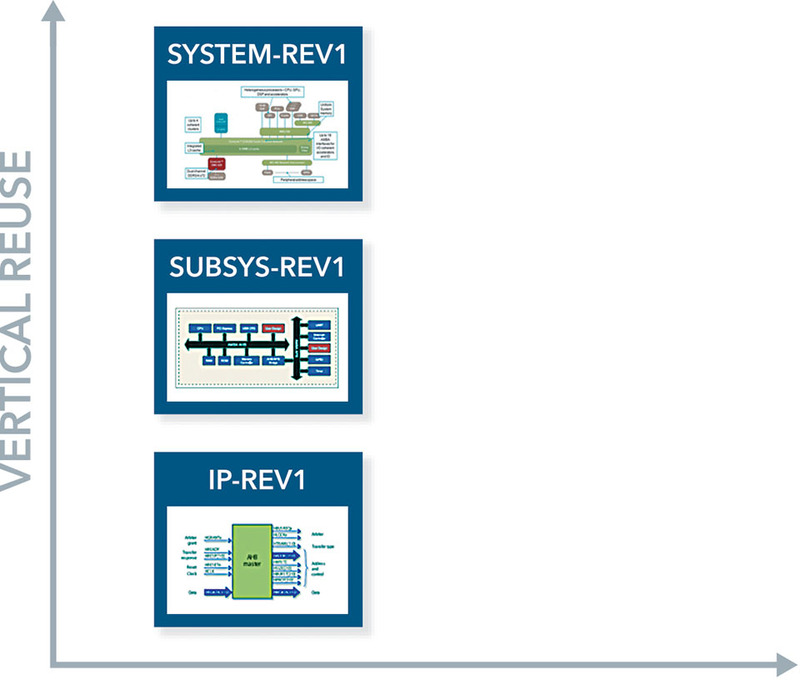 Continuing with our PSS IP to SoC reuse example, we now move up to the subsystem level. Our subsystem shown in figure 5 contains the DMA engine that we looked at in the previous section, but also a UART. Since our goal is to reuse test intent from IP to SoC, we will have created PSS actions to describe the configuration, transmit, and receive operations that we can perform on the UART. Reusing test intent created at block level allows us to create subsystem-level test scenarios to ensure that our IPs are correctly integrated in the subsystem. Now, of course, our PSS test intent for each of the IPs wasn’t created with a specific subsystem in mind. Consequently, we’ll need to customize it a bit in order to reuse it at subsystem level. Fortunately, PSS allows us to extend existing actions, components, and data structures to add new constraints without actually modifying the original code. The code above shows how we customize the operation of the DMA actions to make them work in our subsystem. Our memory-to-memory transfer action doesn’t require any specific customization. As long as we configure memory addresses correctly, the memory-to-memory transfer action will work in any system. The device-to-memory transfer and memory-to-device transfer actions are a different story. These actions must work with a specific IP connected to one of the handshake interfaces on the DMA. Our block-level testbench allowed any DMA channel to use handshake-transfer mode, but our subsystem only uses two of the handshake interfaces, and connects them to the UART IP. The code shown above also customizes the mem2dev and dev2mem actions to force them to only work with the UART. The UART’s receive-handshake signals are connected to the DMA’s channel 0, so we extend the dev2mem action such that it only works with channel 0 and always uses the UART’s address for transfers. Likewise, we customize the mem2dev action such that it only uses channel 1 and the UART’s address for transfers. With this small amount of customization, we can quickly put together a scenario to exercise the interactions within the subsystem using the PSS actions developed for each of the IPs in the subsystem. The graph in figure 6 shows a simple scenario that we might create using the PSS actions for the IPs in our subsystem. Our goal is to exercise the legal behaviors in the system, so our scenario runs one of the follow-ing: a transmit operation on the UART, a receive operation on the UART, or one of the DMA transfer operations. We can certainly build up a few more scenarios from the actions we have available, with the benefit that our scenario descriptions are concise and heavily leverage the modeling work already done by the IP teams. When we get to SoC level, the subsystem that we’ve verified will be combined with a processor subsystem, as shown in figure 7. One big change, from a verification perspective, is that our tests will now run as C tests on the embedded processor in the design. In addition to this big change, there will be some other smaller changes such as the memory map for the full system. The same PSS benefits of flexibility and configurability that we saw at the block and subsystem levels make it easy to customize our PSS content for use in a SoC environment. extend action C = """
First off, let’s deal with connecting our actions to appropriate test realization (implementation) code. The code in the diagram above specifies a mapping between two of the UART actions and the C code API that implements the behavior described by those actions. Just like we customized our DMA actions for use in a subsystem by extending them with additional constraints, we can extend our UART actions to specify that a C API must be used to implement the behavior instead of SystemVerilog code. These C utility functions and PSS test-realization mapping is part of the IP team’s deliverable, so we really just need to select the right files and compile them. In many cases, the scenarios that we developed at subsystem level can be reused with very minimal changes and will provide verification value at the SoC level. This is because at the SoC level, just like at the subsystem level, one of our key verification tasks is to exercise interactions between the integrated IPs. 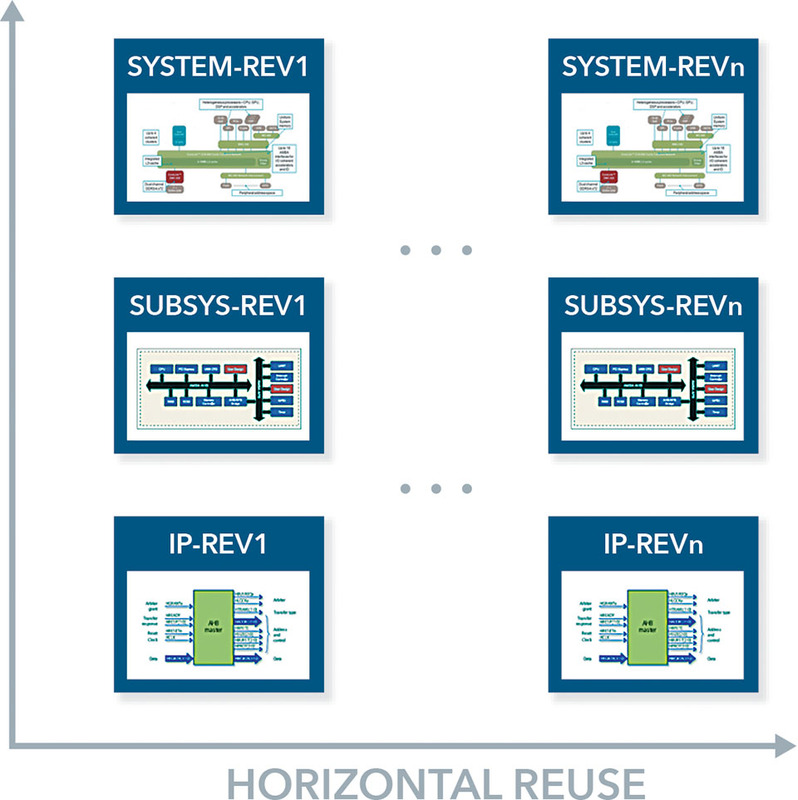 Across this process of PSS reuse from IP to SoC, we have seen several benefits. At block level, we benefited from the higher-level modeling that PSS enables for creating scenarios. At subsystem and SoC, we reused PSS content created by the IP and subsystem teams, respectively, to be able to create our scenarios more quickly. 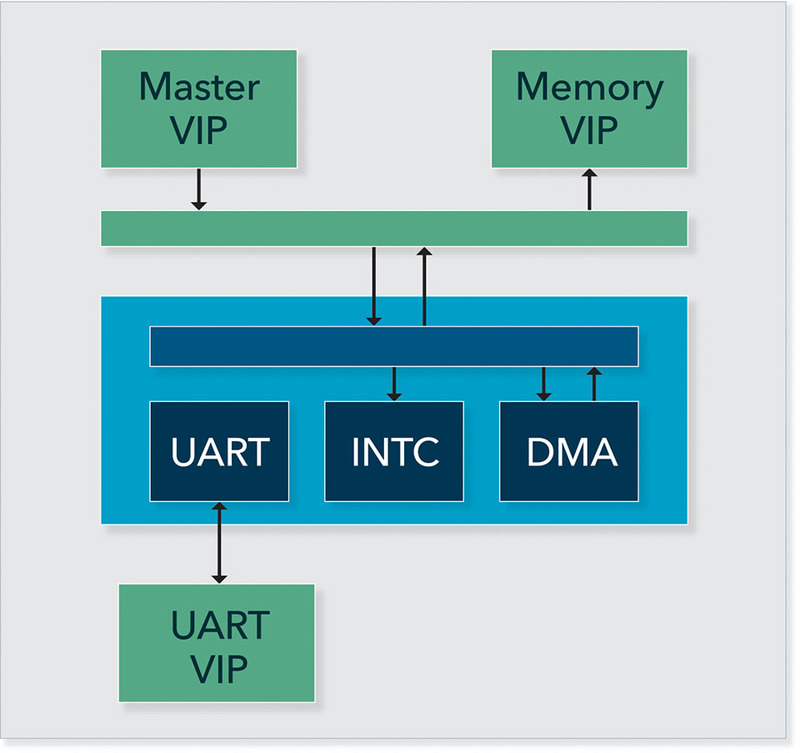 At SoC level, we see this particularly in being able to quickly create SoC bring-up tests that leverage scenarios that have already been verified in a UVM-centric verification environment. This all sounds good, but there are also costs and drawbacks. The primary obstacle to realizing this vision of reusable verification is getting an IP entire supply chain to produce reusable PSS test intent. It is challenging to convince even internal IP teams to develop PSS primarily for use by the subsystem and SoC teams. It’s even more challenging to convince external IP suppliers to provide PSS test intent, and possibly to go back and develop PSS for IPs that already exist. In summary, PSS vertical reuse is definitely a high-benefit, high-cost axis of reuse. These days, a very large number of design and verification projects are actually derivatives of existing designs. 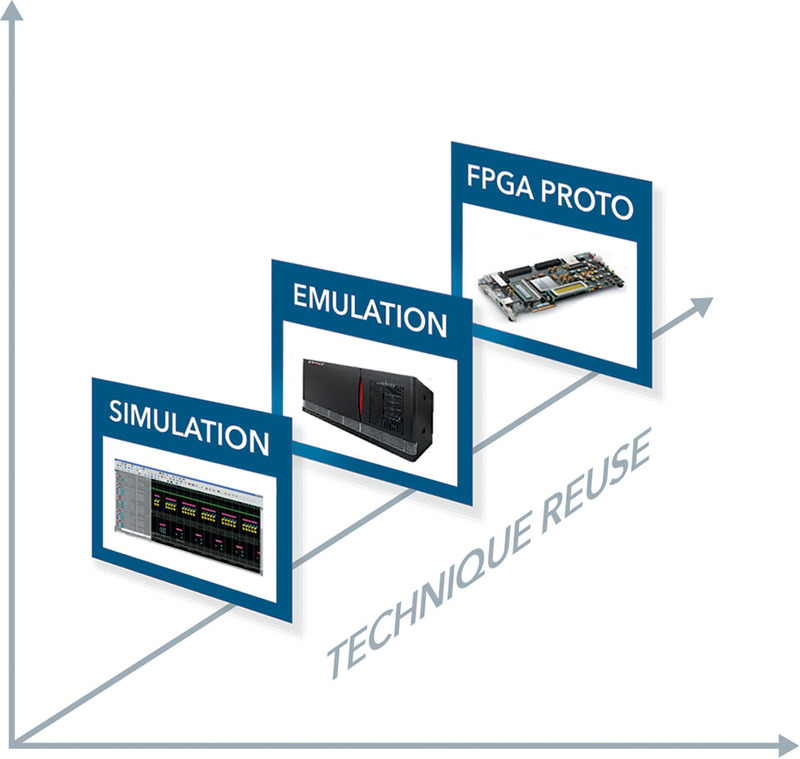 An SoC derivative design might add a hardware IP to accelerate some time-consuming processing. It might, instead, remove some of the dedicated hardware accelerators to create a lower-cost version with fewer capabilities. The bottom line is that the majority of the design remains the same, as illustrated in figure 8. Of course, the entire derivative SoC must be verified, not just what is different from the previous revision. When SoC integration is verified with a suite of directed C tests that run on the embedded processor in the design, a large number of tests need to be manually inspected and updated to ensure that they properly exercise the new functionality. When functionality is removed, tests must be changed to not exercise the functionality that no longer exists. When functionality is added, use-case tests that should leverage the new functionality must be updated to do so. All of this work is quite time-consuming, and really results in each SoC having its own test suite – despite the fact that it was derived from the test suite for its predecessor. In contrast, customizing a PSS model to either add or remove functionality to test is simple. As a declarative specification, new rules (in the form of constraints) can simply be layered on to a PSS model to customize the functionality being tested. Consider the design in figure 9's block diagram. 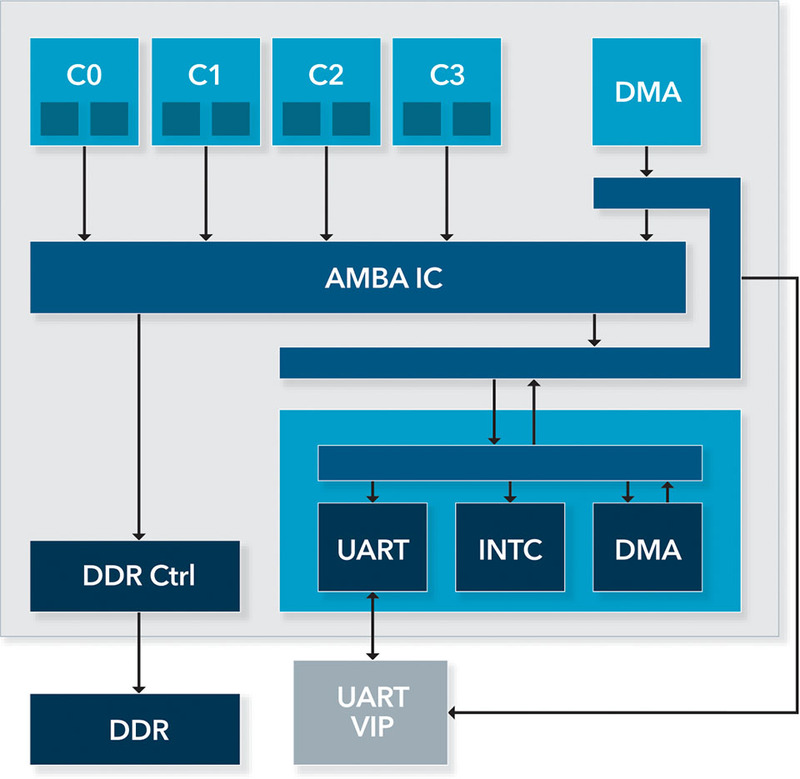 It has two DMA engines – one in the peripheral subsystem, and one at the SoC level. What if we create a derivative design that omits the system-level DMA, while leaving the peripheral-subsystem DMA in place? If our verification test suite is hand-written directed tests, we’ll need to check each of them (or a substantial set) to ensure it doesn’t attempt to run any activity with the system-level DMA engine. With PSS, customizing our test suite is much simpler. The code above was used in the original SoC to allow the DMA engine to work with both subsystem and system DMA engines. The code below is the customized constraint to restrict the PSS model to only work with the peripheral subsystem DMA. Once the PSS model has been appropriately customized for the new design, a suite of tests that is appropriate for the new design can simply be generated. This saves significant time in auditing and modifying the test suite, as well as debugging failing tests. Horizontal reuse is a more-targeted application of Portable Stimulus, compared to vertical reuse. A PSS model must be created to exercise the key elements of the design being verified, but there is no requirement to have PSS descriptions for all IPs that the organization uses to develop SoCs. Of course, the PSS model does need to specify how the design IPs are to be exercised, so developing the PSS model to exercise the IPs could still represent a significant expense. Since the requirements scope is much smaller than vertical reuse (bounded to a project group), the logistics for implementing horizontal reuse are significantly simpler than the logistics for implementing vertical reuse. Horizontal reuse delivers fewer overall benefits than vertical reuse, but the benefits in time savings across project revisions are very significant. And, the startup costs are significantly lower compared to vertical reuse. Nearly every test environment today has a need for high-quality automated stimulus. Whether you’re verifying a C++ design for high-level synthesis, a Verilog or VHDL block, or an SoC, it’s critical to hit the corner cases and leverage test automation to do so. A key challenge is that many test environments don’t natively offer automated stimulus generation. SystemVerilog provides constrained-random generation and functional coverage as part of the language. Consequently, verification engineers using SystemVerilog and UVM have ready access to automated stimulus generation. Users working in C++ or embedded C don’t have a constraint solver to work with, and are either restricted to directed tests or to environment-specific solutions for automating test generation. As illustrated by figure 10 below, PSS provides a way to describe a model from which tests can be automatically generated that works across languages and environments. This allows users to leverage knowledge of the PSS language and leverage tools that process PSS instead of working with a variety of custom solutions. Technique reuse has the smallest startup costs of any of the techniques described in this article. The primary cost is determining how the PSS model will connect to existing utility code to exercise the design. As such, it might be necessary to reorganize some existing code to make it easier to call from PSS. This work is really just reorganizing code to make it more modular, and is just good software engineering. In addition to having the smallest startup costs, technique reuse provides the smallest overall benefits, though the benefits can be significant. Unless coupled with horizontal reuse, technique reuse results in tests that are locked to a specific project, though the tests may be reused across different execution platforms. If you’re thinking about deploying PSS, I encourage you to use the axes of reuse as a way to identify a focal point for your application of Portable Stimulus. While many applications will include aspects of two or more of the axes of reuse, most applications will have a primary focus on one axis of reuse. Picking a focal point helps to identify needed resources, and identify the gap between what is needed and what already exists in your organization. Finally, picking an initial focal point for applying Portable Stimulus doesn’t preclude expanding the application of Portable Stimulus in the future. If anything, it makes it more likely by helping to make the initial deploying of PSS most successful!